You may download and print Gotcha Equine testimonials in accordance with our disclaimer. Three years ago I bought my schoolmaster William, it was spring when I got him, he was a bit stubborn and evasive, but I thought he was just testing me as he was new, summer came and he was great, then Autumn and then later Spring hit in that year and I began having a lot of difficult rides, with even quite a few rears thrown in. I was assured he was very quiet and would suit me well. He had come from fairly drought conditions and he was fine for a short while until my green pasture hit his system. He then became unmanageable for me, both to handle and ride, shying violently and becoming highly reactive to stimuli in his surroundings. I couldn't believe it was the horse that was assured to be very quiet and gentle! He then became very uneven in the front foreleg, so even if I had wanted to sell him I couldn't have. One of my goals had been to find a product that was nutritionally sound and would provide all that my horse needed to be healthy and sound BUT one that I could adjust to suit the ever changing variables of pasture, season, stress (competitions, travel, paddock changes etc), work load, and a red head Alpha mare! Summer (dry period) provides an opportunity to address both diet and nutrition. Since there is less green grass around it is easier to limit lush grass intake. The mineral imbalances caused by the excesses of spring can be addressed by supplementing appropriately. This gives us time to prepare before the autumn rain (wet season), when the grass comes on again prior to winter. Our family have had horses on this property for fifteen years. We never had any problems with rye grass until about ten years ago when the children started on larger horses and the small pony paddocks weren’t big enough. It was then, on the larger farm paddocks that had been sown down with rye and clover, that we started to notice problems, with horses hair falling out and leaving itchy bald patches, misbehaviour and one of our horses had trouble putting on weight, no matter how much hard feed we fed him. I made sure I had Pru on a balanced diet with the correct supplements and I was always getting help with her training from people whom I trusted and who understood her. I also had to be more mindful about supporting her more and allowing her to become more confident in me also. I referred to her as my 'work in progress'. I chipped away at the groundwork, the ridden work and trying to help her to be 'less sensitive' about things. I had her on a magnesium supplement and on a diet which was fairly low energy, but I always felt that I was missing something somewhere. From 'Work in Progress' to Now. 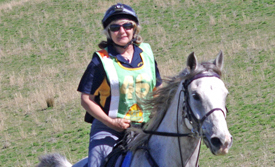 When I was asked to do a follow-up story by Gotcha Equine on my horse Prudence, I was happy to oblige as I have so much to tell from the last time I did a story back in October, 2010. If the results from using the Gotcha Equine supplements were positive back then after some months of use, they are even more evident now ten months later. As most of you will know from reading her story, Pru has not been the easiest horse to own. Very sensitive, quick on her feet, herd bound, spooky, and always tense in her gaits and work. After speaking with Lucy last year, I put Pru on the Gotcha Equine supplements, and she has been on them religiously and without fail. Founder, Feed and Fat Horses. Duke - A New Horse. Lucky's Story - Time to Retire a Gentleman? I have owned him for nearly four years now and in that time we have had our issues (big time). Most of our troubles have been with his body, joints and lameness mostly. Also the nervousness was a little unsettling at times, things that he had seen one hundred times before, became like the big bad monster all over again. We also went through a period where he would take off through his paddock gate, kicking up his legs which was becoming very dangerous. He would nearly knock you over to get through the gate. I couldn't understand it as he was normally quiet, only having the occasional outburst but it was getting worse and happening more frequently. Ten Years Turned Out - Now Back Under Saddle. 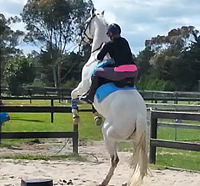 Casper Couldn't Canter (Can Safely Canter Now). All went well for the first three months then one day out of the blue he started biting at himself whilst being ridden. The first time he did it I thought he had been bitten by something as it was so violent. I got off to inspect gear and see if there were any insect bites. Nothing seemed out of the ordinary so I got back on and asked him forward, he did it again and this time it was so bad I thought he would rear if I asked him forward. BJ is Back! The Story of Annette and BJ. BJ started head tossing again and the odd time of trying to bite at the girth while I was riding. He would also plunge his head down to rub on his legs and not bend or relax at all, never mind the constant flapping of his gums! At one stage I could not even get him to trot without really upsetting him. After one such non-lesson where he was drenched in sweat, I took him home and put him on the lunge to see if he could relax, however he just head tossed incessantly and was quite upset, particularly if we tried anything other than a walk. Barry was broken-in in March, 2009, at four years of age and quietly worked through the winter, attending some winter clinics. After shedding the winter woollies and going from the ugly duck to a beautiful swan, he was shown three times in August for a promising start with three Champions and one Supreme. Things looked good for his newcomer season. On the 1st of September things started to crash with Barry starting to get a bit scratchy, a subtle lameness that would seem worse on corners and not real evident which leg it was. Millie is a 13yo Quarter Horse mare, on the third day of Millie arriving she bit me quite severely on my waist. This escalated to the point I so frightened and believe me many a tear was shed. I was not happy with the way she was traveling - her offside hind seemed to be short stepping, quite stiff and she would stumble when asked to canter. The vet came and examined Millie - she did flexion tests that confirmed an issue in her hock. I first saw Jasmine in a drought-affected paddock in 2003, a 3month old Arab foal with her mother, sister and a number of very skinny cows and a handful of brood mares. I chose to keep Jasmine for myself as a project and found good homes for both the mare and Jasmine’s sister. Fortunately this happened just before my personal world turned upside down. My husband and I separated at this time which started a three year long messy divorce and then, not long after that followed my diagnosis of breast cancer. This story is our journey together! I started hard feeding Juno as he came to me in the winter. I was giving him lots of feed, mainly bulk, however he was not putting on any weight, if anything he was losing weight. What to do? If I increased his Lucerne, he would lose even more weight so I started playing around with his feed. I quickly realised I could not feed him big feeds as he just would not eat it all. I went on to processed feed and if it was too sweet he would not eat it, pellets he just did not like and cubes were a no go. So I decided just to go plain feeds such as oaten chaff, barley and a little Lucerne and made up my own combination of feed, specifically tailored for him. Anhydrosis (Puffing or Dry Coat). Rocky was foaled in Victoria but moved to Darwin at the age of three. We purchased Rocky in May, 2009, at the age of six. His previous owner hadn't worked him a great deal but in the time she did, she noticed that he did 'puff' quite a bit. She said she had tried various remedies but to no avail. Toward the end of 2009, as we worked him more and the weather became hotter, it became clear that Rocky had anhydrosis. At one point at the end of 2009 he stopped sweating all together.